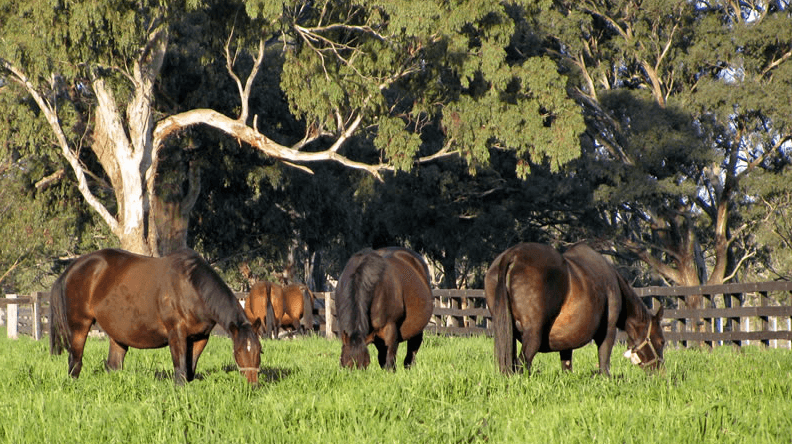 Victoria’s Basinghall Farm is a specialized broodmare farm in the all-important Nagambie breeding region. With a number of key surrounding stud farms, Basinghall offers broodmare owners an exceptional base for the season, and beyond. Owned and operated by Tas and Julie Rielley, Basinghall is first, and foremost, a specialist broodmare facility. Its modern design and first class facilities ensure the safety and wellbeing of the thoroughbreds in the farm’s care. Solid, age-appropriate, fencing enables broodmares and young horses alike to exercise safely. As one would expect from a farm of this calibre, mares are closely monitored throughout their pregnancy and 24/7 foal watch applies to imminent mares. Basinghall’s floodlit foaling unit includes a fully stocked neo-natal stable complex, should it be required. Newborn foals are rugged as required and it’s a given that IgG tests at 12-24 hrs are standard practice. While Julie alludes to the list of services that can be found on the service page of their website (click on the banner advert above), ultimately it’s the professional approach that the farm takes with its core mare and foal operations already mentioned that form the nexus of its, and its clients’, success. In an age where focus on agronomy and ensuring as natural an environment as possible for thoroughbreds has grown in importance, Julie notes, “Our commitment to the land that nourishes our owners’ valuable bloodstock is ongoing and pasture renovation along with the installation of standpipe irrigation to our foaling yards and nine-day yards, as well as pod irrigation to mare and foal paddocks (see below image), allows our equine pastures to remain sustainable throughout the year. Tas's wider interest in the direction being taken by the Australian breeding and racing industries has, over the last decade, seen him serve on the boards of Thoroughbred Breeders Victoria and Thoroughbred Breeders Australia, the Australian Pattern Committee and Aushorse Marketing – all providing an invaluable insight into the industry. Tas was recently appointed to the government’s RIRDC advisory panel, now trading as Agrifutures Australia, which gives him the opportunity to have direct involvement in research and development projects within the Thoroughbred Industry. Like other leading broodmare establishments, Basinghall Farm can list among its graduates many high profile Australian racehorses, however the Rieilleys prefer not to actively tout that aspect of the business, wishing instead to simply concentrate on the significant advantages that their one-on-one operation offers clients and, in turn, their horses.